Our aim is to provide a vibrant, welcoming school library service that supports teaching and learning in the school. We work to build and maintain a strong reading culture for our students. The Library is open daily from 08:50 – 16:00 Monday to Friday. Students are welcomed and encouraged to use the Library whenever possible where they can enjoy the different resources available. In addition to the school library, we also provide an enhanced reading space located in a section of the library where students can read in a relaxed atmosphere. 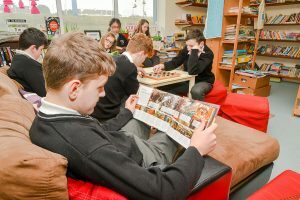 Our Reading Corner supports our aim of making Coláiste Pobail Acla a reading school. The Reading Corner is supported by the JCSP Reading Corner Initiative.